SMI offers compact, flexible systems for dividing and laning bundles and containers of noncylindrical shape. The distribution of the containers within a production line is made possible by the dividers of the 'DV' series. The 'DV ERGON' dividers receive the loose product in single row, they divide it into several rows and lane it towards the secondary packaging machines. 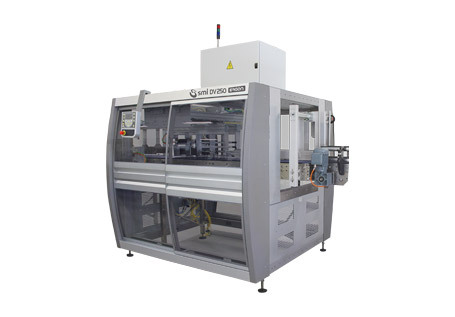 continuous motion DV 500 S, with a maximum output of 600 containers per minute (*). (*) the outputs are referred to a ø 50 mm PET container. SMI dividers are made of top-quality materials, ensuring operating reliability and long-term duration. The use of wear-resistant components minimizes the maintenance and cleaning operations, thus reducing the total operating costs.